Five freeform shapes created by our sketch-based modeling approach, with the corresponding planar sketches. The curvy container is a single surface patch, the crane, pillow and teapot are each made from two symmetric surface patches, and the skirt is made from two surface patches sketched individually. See paper for annotations of the sketched strokes. Sketch-based modeling provides a powerful paradigm for geometric modeling. Recent research had shown, sketch based modeling methods are most effective when targeting a specific family of surfaces. A large and growing arsenal of sketching tools is available for different types of geometries and different target user populations. 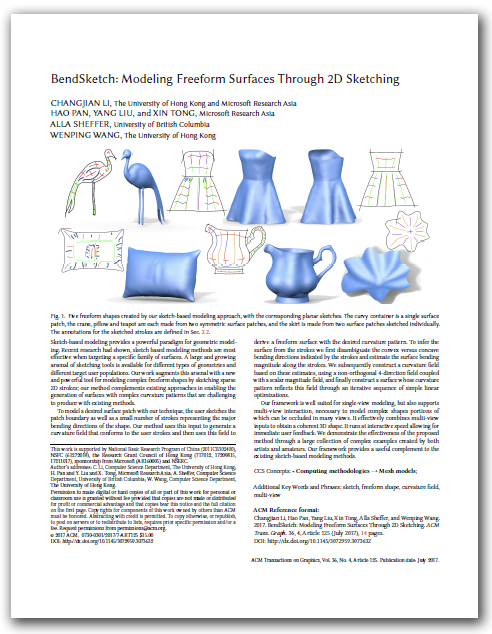 Our work augments this arsenal with a new and powerful tool for modeling complex freeform shapes by sketching sparse 2D strokes; our method complements existing approaches in enabling the generation of surfaces with complex curvature patterns that are challenging to produce with existing methods. To model a desired surface patch with our technique, the user sketches the patch boundary as well as a small number of strokes representing the major bending directions of the shape. Our method uses this input to generate a curvature field that conforms to the user strokes and then uses this field to derive a freeform surface with the desired curvature pattern. To infer the surface from the strokes we first disambiguate the convex versus concave bending directions indicated by the strokes and estimate the surface bending magnitude along the strokes. We subsequently construct a curvature field based on these estimates, using a non-orthogonal 4-direction field coupled with a scalar magnitude field, and finally construct a surface whose curvature pattern reflects this field through an iterative sequence of simple linear optimizations. Our framework is well suited for single-view modeling, but also supports multi-view interaction, necessary to model complex shapes portions of which can be occluded in many views. It effectively combines multi-view inputs to obtain a coherent 3D shape. It runs at interactive speed allowing for immediate user feedback. We demonstrate the effectiveness of the proposed method through a large collection of complex examples created by both artists and amateurs. Our framework provides a useful complement to the existing sketch-based modeling methods. Surface sketching pipeline for one view. From left to right: the input strokes are parsed with labeling of spatial convexity (red/blue for convex/concave), the 2D domain is triangulated, the 2D 4-direction field is computed to model curvature directions, and the complete 2D curvature field with curvature directions and magnitudes (red/blue for positive/negative curvatures) is computed, along with the solved surface. ©Hao Pan. Last update: May 22, 2017.